An historic lighthouse designed by the Robert Louis Stevenson’s father is up for sale for £367,500 – almost double the price it went on the market for four years ago. The beautiful Stoer Head Lighthouse dates back to the 1870s and was designed and engineered by David and Thomas Stevenson, Thomas being the father of Robert Louis Stevenson. The property sits in the most westerly point of Assynt in north-west Sutherland and has increased in value by over £150,000 from 2013 when it was up for sale at just £210,000. Since last on the market, the property, made up of two, two-bedroom apartments, has undergone renovation.in the sale along with the two flats – which feature a “spiral staircase” – is an external Bothy set within the lighthouse walls.unusual home can be sold as one complete property or divided up into separate sales. As a whole, agents for the sale Bell Ingram are requesting offers over £367,500. However, the two apartments can be bought independently for £170,000 and £175,000 with the bothy available for £22,500. Although prospective buyers who are used to being a little closer to civilisation should be aware the nearest shops are about 12 miles away. On a clear day views from the lighthouse, which enjoys a beautiful, isolated spot, can extend for miles, with the possibility of seeing Harris, Lewis and south to the Torridons and Skye. With “stunning sea views from all rooms” Bell Ingram said in their brochure the lighthouse provides ideal privacy. It reads: “The apartments within the Lighthouse have outstanding views to the south and west. The light became automated in 1978 and the tower is still operated by the Northern Lighthouse Board. Standing at 45-ft (14 m) high, the tower is relatively small , but the sitting on top of the huge 580-ft (177m) cliffs means it can be seen at a distance of 24 miles (39 km) out at sea. 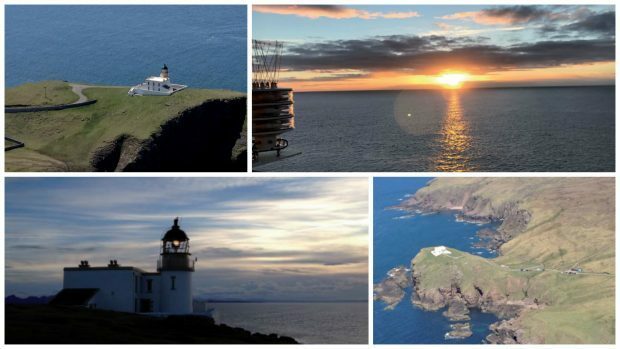 Annually, the historic lighthouse attract around 10,000 visitors and is accessed via a narrow single track road.the isolated location, the Stoer beacon is only around half a mile away from a scattering of houses at Raffin, Sutherland. The nearest shops can be found at Drumbeg, or Lochinver, about 12 miles away.